Create your own look by combining the Asian Headboard with the Panel Footboard. Here you have the same clean lines but a look that is unique to your bedroom. 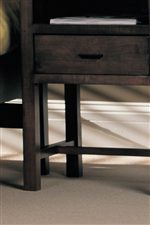 The Soma Queen Low Profile Asian Bed by Durham at Stoney Creek Furniture in the Toronto, Hamilton, Vaughan, Stoney Creek, Ontario area. Product availability may vary. Contact us for the most current availability on this product. Bed Construction Solid wood bed rails are finished to match the bedroom suite and shipped with all beds. 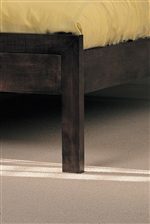 Also included are solid hardwood or metal bed slats for years of dependable use. This collection offers great style and functionality through casual looks with thoughtful decorative details finished in a warm tone. Details with a timeless touch adorn the clean lines of the beds and drawers. Useful storage in beautiful cases with cedar bottoms, coordinating mirrors, and the option of underbed storage drawers allow you to organize in style. Create a welcoming bedroom that works well in a variety of spaces with this elegant contemporary bedroom set. The Soma collection is a great option if you are looking for Contemporary furniture in the Toronto, Hamilton, Vaughan, Stoney Creek, Ontario area. Browse other items in the Soma collection from Stoney Creek Furniture in the Toronto, Hamilton, Vaughan, Stoney Creek, Ontario area.